The wilderness boundary for Sylvania was drawn so as to cross the water at the north end of Crooked Lake. The entire lake could not be included within the wilderness, since there were several private properties (homes, cottages, and a resort) on the north bay of the lake. Therefore, the north bay of Crooked Lake is outside the wilderness, while the rest of the lake is within the wilderness. The Wilderness Act of 1964 generally prohibits the use of motorized equipment, including motorboats. The Forest Service therefore issued a decision and Forest Plan Amendment, based upon the analysis of a 1994 Environmental Assessment, to allow only electric motors (up to 48 lbs. thrust) for all watercraft users within the wilderness portion of Crooked Lake (as well as Big Bateau and Devils Lakes on which there also had been pre-existing use of gas motors), beginning April 1, 1996. Several court cases, initiated by two private property owners on Crooked Lake (the owners of the resort and the owner of another private property) ensued over this decision. The federal courts ruled that the two private property owners who challenged the Forest Service regulations, and their guests, are permitted to use gas motors on the entire surface of Crooked Lake. This court order now applies to only one property owner and the owner’s guests, since the resort was sold and no longer allows gas motors. All other users must either power their boat/canoe by hand, or are permitted to use electric motors (only), up to 48 lbs. of thrust, on the wilderness portion of Crooked Lake. As early as 1994 it was recognized that there is a direct threat of introducing aquatic invasive species into Crooked Lake as a result of motorboat activity. This threat also presents the further possibility of spreading aquatic invasive species to other lakes in the Sylvania Wilderness. Eurasian Watermilfoil, a non-native aquatic invasive species, was first detected in Crooked Lake in 2002. The infestation was confined to a small area around the boat landing. Since the initial discovery of EWM, individual and small groups of plants have been discovered each year; these either have been hand-pulled or treated with herbicide. (For a detailed history of EWM in Crooked Lake, click here.) EWM tends to displace native species, and could potentially occupy up to 69% of the surface area of the lake if uncontrolled. EWM is easily transported on boat trailers and thus can spread quickly from lake to lake. 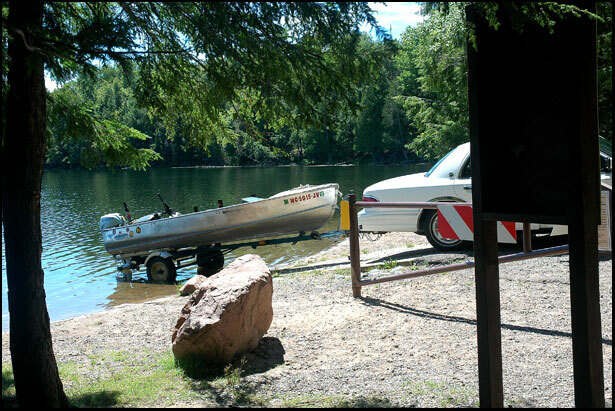 The initial source of EWM in Crooked Lake was likely transported there via boat trailer. Source: Excerpts from ONF memo "Sylvania Wilderness, Crooked Lake, Sept. 2011"
In September 2011, the Ottawa National Forest released a 5-page proposal, entitled "Sylvania Wilderness, Crooked Lake - Prevention, Control and Containment of Non-Native Invasive Species" aimed at reducing the threat of introducing and spreading aquatic invasive species into Crooked Lake. The proposal consisted of 3 options. Option #1 would maintain the status quo, which is just monitoring the existing infestation of Eurasian watermilfoil and removing plants if they are found. Option #2 involved introducing milfoil beetles to attempt to control the E. watermilfoil biologically. Option #3 involved modifying the Crooked Lake boat launch to make it a "carry-down" facility, and would no longer permit boats to be launched from trailers. Boats launched from trailers are the primary way in which aquatic invasive species are introduced into our lakes, as fragments of weeds and invasive animals (such as zebra mussels) can easily be attached to the trailer itself, the boat propellor, boat hull, and other locations on a boat/trailer. 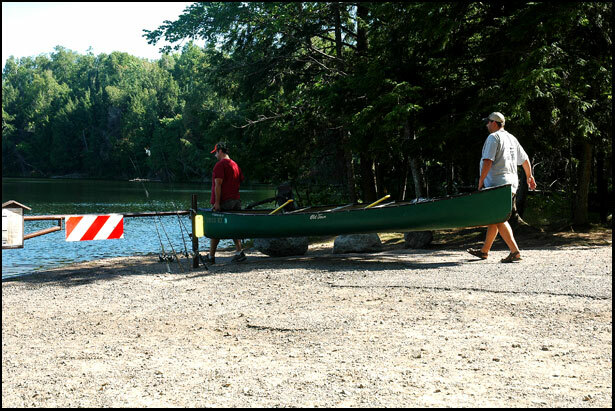 Canoes, kayaks, and small boats would still be permitted to be launched into the lake under Option #3, if they can be carried a short distance to the lake. Since Crooked Lake is primarily a wilderness lake (except for the north bay), a carry-down launch would be most consistent with the primary use of the lake (as a trailhead for canoes, kayaks, and other small watercraft making trips into the wilderness). The Friends of Sylvania and several other concerned individuals and environmental groups strongly supported Option #3, as this is by far the best way to reduce the threat of further introductions of aquatic invasive species into Crooked Lake. Option #3 also would greatly reduce the potential for unauthorized gas motorboat use within the wilderness portion of Crooked Lake, which has been an ongoing problem for the Forest Service for many years. On January 18, 2012, the Ottawa National Forest announced in a letter to all interested parties that the Crooked Lake boat landing would be modified to a carry-down only facility to prevent the introduction and spread of aquatic invasive species into the lake. The ONF recognized that some individuals may not have the strength to lift and carry their boat to the water’s edge; to address that concern, the ONF planned to explore the availability and development of a facility that may be used to assist such individuals. The ONF furthermore stated that they are working cooperatively with the Crooked Lake riparian owners on an agreement that would provide the owners the opportunity to continue using the existing boat landing via a gate to access their lake front property and for motorboat use in the non-wilderness portion of Crooked Lake. The owners of the Foxes Den rental duplex, their family members, and guests would continue to use motorboats in the wilderness portion of the lake as provided by the previous federal court order. 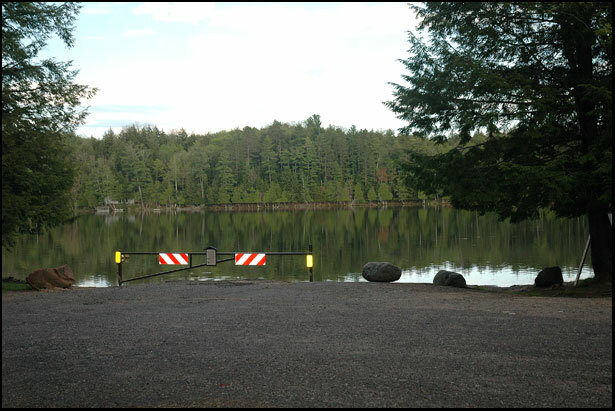 On April 5, 2012, the Ottawa National Forest announced that a gate had been installed at the Crooked Lake boat landing. Of the riparian owners, only the owners of the Foxes Den signed an agreement with the ONF and therefore have a key to one of the locks at the gate which is being used by their guests who bring their own boats. This agreement will expire at the end of 2012 since the owners of Foxes Den are planning on having their guests use boats owned by the Foxes Den, starting in 2013. One remaining issue concerns the use of gas motorboats in the wilderness by some of the other Crooked Lake riparian owners who do not have the legal right to do so. The Friends of Sylvania are monitoring this situation. The emerald ash borer is moving toward Sylvania at a much faster rate than expected. It is now less than 100 miles away. Go to Growing concerns: invasive species for more information. Do not bring firewood in from anywhere but purchase it in Watersmeet.